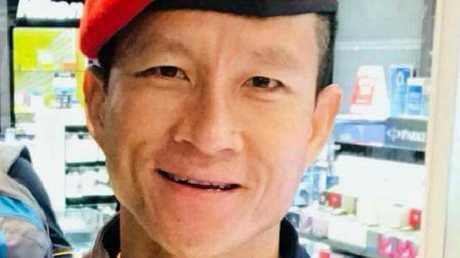 THE wife of former Navy Seal Saman Gunan - the only person not to survive the cave drama - has paid an emotional tribute to the man she calls "the hero in my heart". The 38-year-old was working as a volunteer when he lost consciousness underwater during the rescue mission late last week as he placed extra air tanks inside the cave. His death sparked fears there was no way the 12 boys and their soccer coach would make it out of the northern Thailand cave system alive. The family of former Navy Seal, Saman Gunan, have paid tribute to him as the world celebrates the safe rescue of the 12 boys and their football coach. They did though, late last night, and the whole world appears to be celebrating some rare good news. But Mr Gunan's family are preparing for life without him. In an emotional BBC interview, his wife Waleeporn Gunan and father Wichai Gunan spoke about their loss. "Everyday before we left for work, we said we loved each other," Mrs Gunan said. "At midday, we would text to see if the other had lunch." She said she had discussed death with the man she "loved so much". "Saman once said we never knew when we would die ... We can't control that so we need to cherish each day." Now he was gone, it was as if she too had died. "If you ask me if I'm sad, it's like I have died but am still alive, [but I] use my pride to repress my sadness." His wife Waleeporn Gunan says she is devastated but proud. Mrs Gunan told the BBC her husband loved charity work and helping others. "He has been praised as a hero for who he was ... I want to tell you honey, you are the hero in my heart, you always were and always will be." Wichai Gunan said he was sad but proud. "My beloved son, may you rest in peace." Early today, rescue mission chief and Chiang Rai governor Narongsak Osottanakorn said Mr Gunan was the "hero of the Tham Luang cave", which was met with a huge cheer. "He was a very capable SEAL and a triathlete who liked adventure sports." the Thai Navy SEALs wrote in a Facebook post Friday, after Mr Gunan's death had been announced. "Although he resigned from the unit, he still loved and had a good connection with all the SEALs. "Even the last part of his life, 1st Petty Officer Saman left us and this world while working with the SEAL brothers who are also trying to go forward and complete the mission as planned. "His determination and good intention will always be in the heart of all SEAL brothers. Today, you get some good rest. We will complete the mission for you." 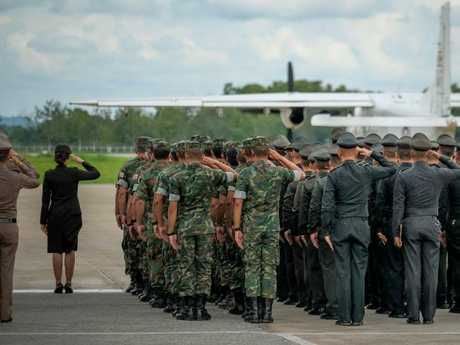 Members of the armed forces stand a salute as the body of Saman Gunan is flown back to his home town. He was a former member of the Royal Thai Navy's Underwater Demolition Assault Unit, which is known as the Thai Navy SEALs. After quitting from the unit, he worked as a patrol officer at Bangkok's international airport. He recorded a video of himself just before he left for northern Chiang Rai province to join the rescue effort. In the video he said he wanted to help "bring the boys back home". "Loaded all my stuff on to the plane. I'm ready to fly to Chiang Rai," Mr Gunan said in Thai on the self-shot video, reported the Associated Press. "See you at Tham Luang in Chiang Rai. May good luck be on our side to bring the boys back home."